Nestled in South Buckinghamshire in the beautiful Thames Valley, Burnham Beeches has over 650 members who regularly play this challenging and testing course. 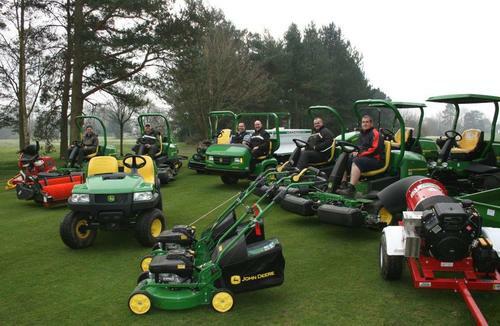 To keep a golf course which has been played on for over 120 years at its best you need a dedicated team of staff and reliable equipment to maintain the 160 acres. The 18 hole parkland course has a committed team of 6 full time greens staff headed up by Lee Bishop who has been at the club for the past 16 years. The new machine line-up is mainly made up of John Deere equipment with some innovative attachments to compliment them. Heading up the fleet are a pair of John Deere 8800 5 deck rotary machines for the roughs and a pair of 7700 5 gang fairway mowers followed by two 7200 semi rough triple cylinder mowers which also handle the first cut. The greens are looked after by two 2500E hybrid 3 cylinder machines equipped with 11 blade cutting heads, and a pair of 3 gang 2500B fitted with 7 blade heads and rear roller power brushes cut the tees. For other smaller areas around the course and club house a pair of 54cm cut JX90 commercial walk behind mowers handle the job with ease. A John Deere Pro-Gator married with a Dakota 410 spreader makes the ideal machine for applying top dressing and the smaller CX Gator and JSM sweep-n-fill brush makes light work of making the greens ready for playing along with removing thatch and moss from other grass areas. A 36HP John Deere 3520 compact tractor works in harmony with the Aercore 1500, a 1.5mtr aerator working at a maximum depth of 4 ½” with hollow, solid or micro tines. Other new machinery included a Green Tech slitter with 6” spikes and a Buffalo KB4 blower for removing debris, leaves and grass from the course. A Tru-Turf RS48 self-propelled greens iron ensuring a smooth playing surface and an Allett BJB42 scarifier to be used on the tees and approaches. All of the smaller machinery is transported around in two large TFM Groundcare trailers towed behind the Gators. The course is mainly laid to mainly rye, poa annua and bent mix of grass and is kept in the summer playing season to heights of cut of 72mm on the rough, 25mm on the semi rough, 15mm on the fairways, 9/10mm on the tees and approaches and 3mm on the greens. Mowing ranges from daily to once a week ensuring the course is always looking its best. Lee is currently heading up a 3 year bunker renewal program, reshaping and refreshing all of them over the course. With the success and outstanding upkeep of the course by Lee and his team, Burnham Beeches will be hosting British Amateur Ladies Open in 2016 and more tournaments for the future.